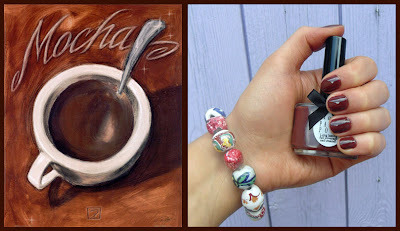 Mine's a Mocha is a big favourite of mine, this is the only brown nail polish I own! The consistency of this one is the same as the others but the pigmentation is much better than the others. It dries VERY quickly to a high gloss finish with no streaks! It's a very gorgeous and sophisticated rich brown, and is an all season colour. It would look great in the summer teamed with bright clothes or great in the fall with warm colours. Mine's a mocha, is yours? I have recently cut my nails REALLY short, as I have become a little bit of a hygiene freak, under the nails is where you carry most of the bacteria in your body, I tend to touch my face without realising so decided that short nails is the best option! Ciaté paint pots are available from their website, Asos, Powder Rooms and HQ hair. Your photos are beautiful, plus the polish is stunning. I know what you mean, I've always had short nails and now that they've grown I'm obsessed with keeping under them clean. Thank god for nail brushes. where's the gold ring from? this is the perfect brown color! it's rich and not muddy at all. it looks so good with your skin tone. do they ship to the US? 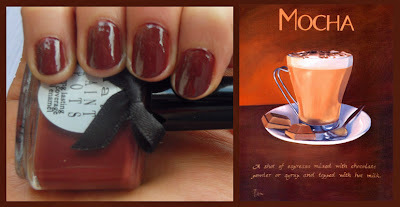 What a yummy brown, I am a bit of a chocolate nail varnish addict so this looks right up my street. I will check it out. I agree, short nails are the best. The polish is adorable, the bottles UGH.... I wish we had them in the US. @amaze me it's actually a huge wooden ring with a creamy gold stone on it, it's from Topshop - but very old! This has to be my favourite colour of the collection so far (: Love the dark chocolate colour. O wow i love thisss! I never heard of this brand before but the colors are all lovely. The bottles are very pretty with the bow. I have the same feeling about my nails recently and keep them really short now. A lot easier to take care of aswell. I actually prefer them short. Dark colors seem to look better on shorter nails. If you do find the lip liner do let us know what you think. I will be soo happy if I have found a good dupe for Oak lip liner. 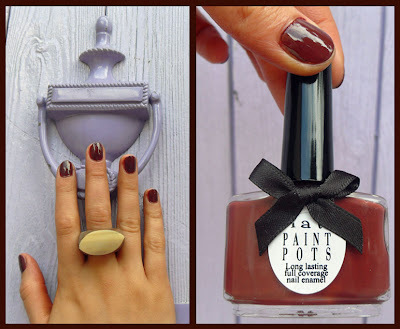 That's such a cute nail polish bottle hehe .. Love the door knocker photo, you have a good eye for photography.